Please visit our related Home-and-Garden category stores. 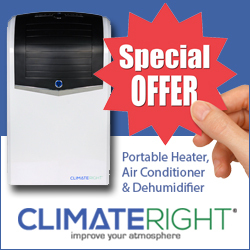 ClimateRight is dedicated to "improving your atmosphere" by providing air comfort and air purification products. They expanding product line includes room air purifiers, portable room heat and air conditioning units, and portable outdoor heat and air conditioning systems. Climate Right have expanded into other proprietary designed, engineered and manufactured air comfort, air quality, water quality, and power generation equipment with the addition of Westinghouse portable power products. Whether it is your home or office, you deserve the air and water you breathe and consume to be comfortable and clean. Found a coupon for ClimateRight?